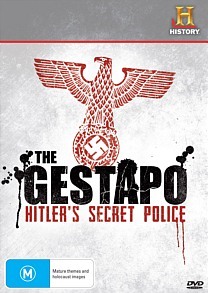 The Gestapo: Hitler's Secret Police DVD Review This fascinating three-part documentary from HISTORY explores the inner workings of the Gestapo, from its comparatively modest origins to its rise to prominence as Hitler’s main instrument of fear. Very few state organisations in history have instilled fear into citizens like the Gestapo, Adolf Hitler’s secret police. In the 12 years of its operation from 1933 to 1945, this sinister agency run by SS head Heinrich Himmler and his ruthless deputy Reinhard Heydrich terrorised at first an entire nation and then finally an entire continent. During the darkest days of the Nazi occupation of Europe, the most dreaded sound was a knock at the door after dark. Everyone who lived under Nazi rule lived in fear of the black-booted agents with the power over life and death. Hitler called them his ‘deadliest weapon,’ and without agencies such as the Gestapo his genocidal ambitions could never have been fully brought to fruition. Within six years of its inception, the Gestapo had grown from a regional secret police force into a crucial executive arm of the Nazi Party. By the outbreak of World War II, it had evolved into a wide-reaching organisation whose success in crushing resistance to the state was unparalleled. As the war in Europe raged, the Gestapo extended their operations to include areas under German control, leading to a new era of terror which culminated in the Final Solution. In addition to gathering intelligence, investigating reports of espionage and treason, interrogating suspects and imprisoning political dissidents, Jews and other ‘undesirables’ without trial, the Gestapo also implemented one of Hitler’s most terrible orders - the infamous Night and Fog Decree, under which thousands of political prisoners simply disappeared whilst under Gestapo custody. In many cases their bodies were never found, and their families did not fully learn the truth of what had happened to such prisoners until years after the war, if at all. This fascinating three-part documentary from HISTORY explores the inner workings of the Gestapo, from its comparatively modest origins to its rise to prominence as Hitler’s main instrument of fear. Over its movie-length running time the series incorporates period footage, re-enactments, primary source material and eyewitness testimony, expertly building a comprehensive picture of a sinister organisation that held the power of life and death over millions.